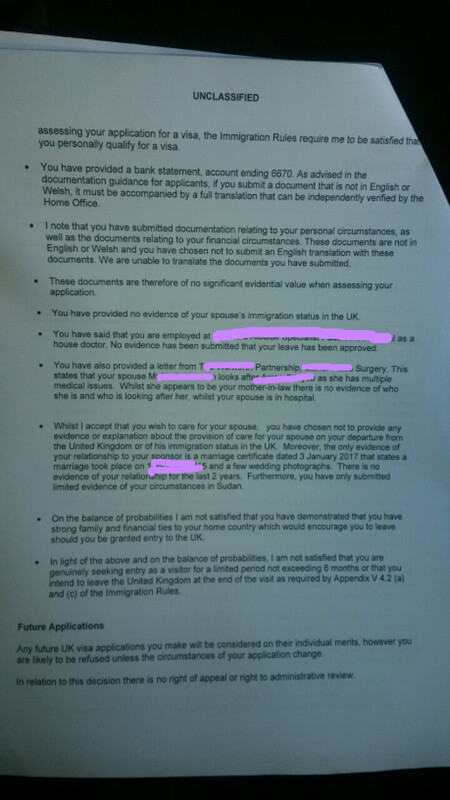 I have applied for a UK visitor visa to see my sick husband (who has ILR) in the hospital. It was my very first application ever, as I never intended to go to the UK until I finish my mandatory housemanship/internship training. I urgently applied after my husband fell ill so suddenly, without thinking a lot about it and, ten days later, it got refused. I'm reapplying again, after correcting what went wrong the last time. I am also making a human rights claim in my application this time around because I think I qualify for one. My husband of 2 years is bedridden in hospital so going there is the ONLY option. I cannot even talk to him on the phone because he has had brain surgery. I am attaching pictures of the refusal notice. Do I have a chance this time after submitting all the right documents? My bank statement does show regular flow of income but it's empty at the moment. As a junior doctor who is still training I get very little pay, my husband is my provider. I am being sponsored by my sister-in-law and her husband, both of whom are British citizens. Will an empty bank account adversely affect my application the next time despite the 3rd part sponsorship? Will a frank human rights claim attract more consideration from the ECO? To at least refer the case to the ECM or grant me the right to appeal in case refused? They previously stated I had limited evidence of my circumstances. Although I attached a letter from my mother stating that I'm the eldest of 5. Mom is a widow. But now I am attaching copies of my siblings' passports, 2 property deeds. I co-own the house we're living in with mom and siblings and I also have inherited another house that was owned by my father. In addition to my very important work, do these constitute what they consider "strong ties to home country"? My bank statement (showing an opening balance of about 850£, regular salaries and withdrawals over 6 months, closing balance of 10£). My employment letter (showing no objection to leave with dates/ stating I need to come back and make for the absence). Letter of internship from federal ministry of health. Letter from Sudan Medical Council showing I have preliminary registration with my reg. Number and that I will be granted full reg after completing internship. Letter from the money exchange agency stating that my husband has been sending me monthly allowance from 1st receipt to last receipt. Property deeds (one of which I co-own with siblings and mom, other one is inheritance). Copies of mother's and siblings' passports. Letter from my mother saying I help her with my younger siblings both financially and emotionally and that she wants me to become a fully registered doctor and pursue my career (something I will NEVER be able to do if I go underground in UK). My own cover letter explaining my circumstances and list of documents. Photographs of myself, my husband, my sister-in-law and her husband on family occasions. Passport copy of my sponsor. Bank statements of sponsor's spouse. Legal affidavit from my sister-in-law clarifying our relationship, and that she is taking care of her mother, and that she will take care of her brother after I leave. Letter from the hospital where my husband is at (2 actually the older one and a newer one from a different hospital as they've moved him). Will these documents make my application stronger this time? 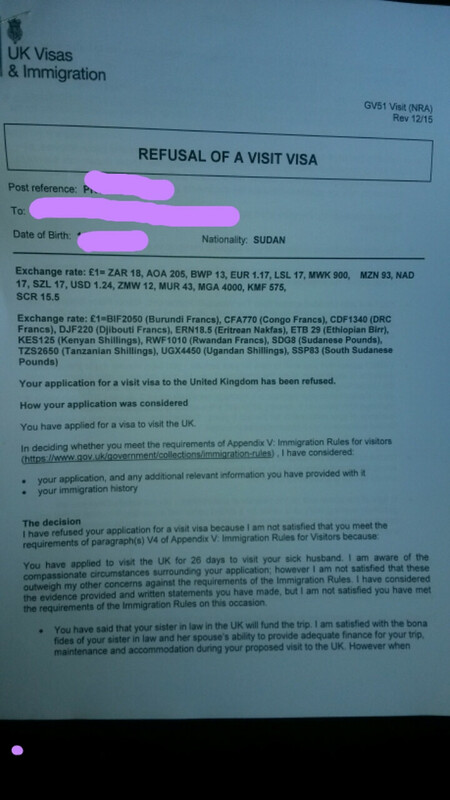 You submitted a very weak application for a Standard Visitor Visa and got refused on Appendix V 4.2 (a) + (c). Usually that combination is a indicator that they decided you would go underground in the UK and eventually become reliant upon public funds. Your premise was to visit your spouse who is seriously ill. You posted your refusal notice and have some questions about it because you contemplate a fresh application. Yes, of course an empty bank account will hurt your chances of success. You can read in your refusal notice that they have conceded the 'bona fides' of your sponsors and have similarly conceded your sponsor's capacity. Sponsorship is not the issue and will not be the issue next time (as long as your sister-in-law extends her sponsorship offer). In this article: Should I submit bank statements when applying for a UK Visa? What do they say about me? we also explain that it's not about the ending balance. They will be looking for a cash flow stream that shows you are 'plugged in' to the local economy in the Sudan. If your bank statements are not providing that kind of picture you can expect serious problems. Will a frank human rights claim attract more consideration from the ECO? Let's back up and make a clarification... Human rights, in the context of Article 8, i.e., the right to family life, are not applicable to visitor applications. They apply to settlement applications only, like a spouse visa or leave to remain as a family member. Plus the courts have already ruled that visiting the UK is not a human right; to rely on Article 8, you need to make a settlement application and we don't field questions about them here (That area belongs to Expats). So with that clarification, what is appropriate in the domain of visitor visas is compassion. ECO's have a massively broad width of discretion when compassionate circumstances appear. The discretionary consideration kicks in when they read the person's premise, it's virtually 'automatic'. And contrary to what people may think they are not heartless ogres and people who qualify get the concession all the time. It's written in your refusal notice that the ECO treated your application as compassionate. Having a compassionate occasion, however, does not always result in success. ‘Where an entry clearance application does not meet the requirements of the Immigration Rules, the Entry Clearance Officer must consider whether there are exceptional circumstances or compassionate factors which mean the Home Office should consider granting entry clearance outside the Rules. or at least refer the case to the ECM? Refusals where there are compassionate circumstances are automatically referred to the ECM for review (or more formally the "Referred Casework Unit"). It's standard procedure and has already happened for you. or grant me the right to appeal in case refused? They are not going to do that no matter what. In the upper right corner of your refusal notice you will see "GV51 Visit (NRA)", and the "NRA" stands for "No Right of Appeal". If you were close or a borderline case they would have contacted you for an interview. In addition to my very important work, do these constitute what they consider "strong ties to home country"? No they do not. People can collect property income from anywhere in the world, they are not a binding factor. Wedding photos are of marginal help when the other evidence is really strong, they are not fundamental enabling documents. They want to see pay slips, bank statements, employment contracts, and evidence that indicates a stable lifestyle. The stuff you listed would not carry your application. Just to repeat, they extended credibility to your sister-in-law as a person with the capacity for sponsorship. That part of the decision-making process was decided in your favour. They treated your application as a compassionate one and your refusal was examined by the higher ups. Accordingly, making a back-to-back fresh application right away would be misconceived without correcting everything (including the required translations to English or Welsh). If you apply again, they will, however, assign it to a different ECO so as to get a fresh take on your compassionate circumstances.